All the industry buzz would lead an unsuspecting observer to believe a combination of cloud, containers and DevOps will magically deliver digital business nirvana. Cut through the hype and you'll discover substantial challenges remain in the form of tech complexity. 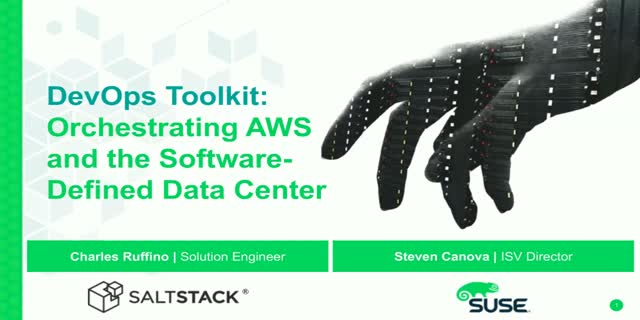 In this presentation and demonstration SUSE teams with SaltStack to show how smart orchestration and automation tooling can supplement DevOps teams and processes to get the most out of fundamental cloud technologies like Amazon Web Services. Done right, more agile business is possible through cloud control layered with configuration automation, continuous code deployment and event-driven DevOps orchestration.